Where Was the Salt? Not on Westminster Road. Mike Bloomberg said that budget had nothing to do with the screw-up. He also avoided admitting any management errors — even his own, when he hamstrung veteran Sanitation Commissioner John Doherty. He placed Doherty under the control of a new deputy mayor whose nominal assignment — operations — took a back seat to his obligation to trim the budget. Deputy Mayor for Operations Stephen Goldsmith cut the legs out from under Doherty and destroyed Sanitation Department morale in October by announcing that he would demote 100 supervisors at the end of 2010 and retire 100 more. His edict forced out experienced workers who feared for their pensions. Many supervisors and other retirees didn’t get replaced, cutting the department’s field force head count. The smaller field force meant that Doherty had no choice but to redeploy office workers into the field to deal with the storm. They didn’t have a clue. The missing supervisors were the department’s most experienced snow fighters. Now they were gone, or at least, demoralized. This may have been as important as City Hall’s most obvious error: its delay in declaring a Snow Emergency. Goldsmith, away in Washington, D.C. for the Christmas holiday, says he was not consulted by phone. Had emergency managers declared the Snow Emergency on Saturday, when the storm’s approach was confirmed but before the heaviest snowfall had started, parking would have been banned on major arteries and salt could have been spread to prepare streets for plowing. But declaring the emergency on Saturday would have meant calling in workers at holiday double overtime rates to mount chains and spread the salt throughout the city. Apparently, without an OK from his budget-cutting boss, Doherty didn’t do it. By Sunday it was too late. Without salt on most roads, fast-falling snow quickly got compacted into hard ice. Plow blades skidded over it ineffectually. Westminster Road between Newkirk and Foster Avenues in Brooklyn still was packed with a half-foot of ice at this writing, five days later. John Doherty arguably is the best Sanitation Commissioner New York City ever has had. But Bloomberg placed him under the control of someone whose mandate was to cut costs. It was an unfair contest. This entry was posted in The Mayor and tagged DSNY, John J. Doherty, NYC snowstorm December 2010, Snow Emergency, snow removal, Stephen Goldsmith. Bookmark the permalink. I never in my wildest imagination ever thought I would envy New Jersey local government. After this week’s “cheap” blizzard, I am a believer in New Jersey! 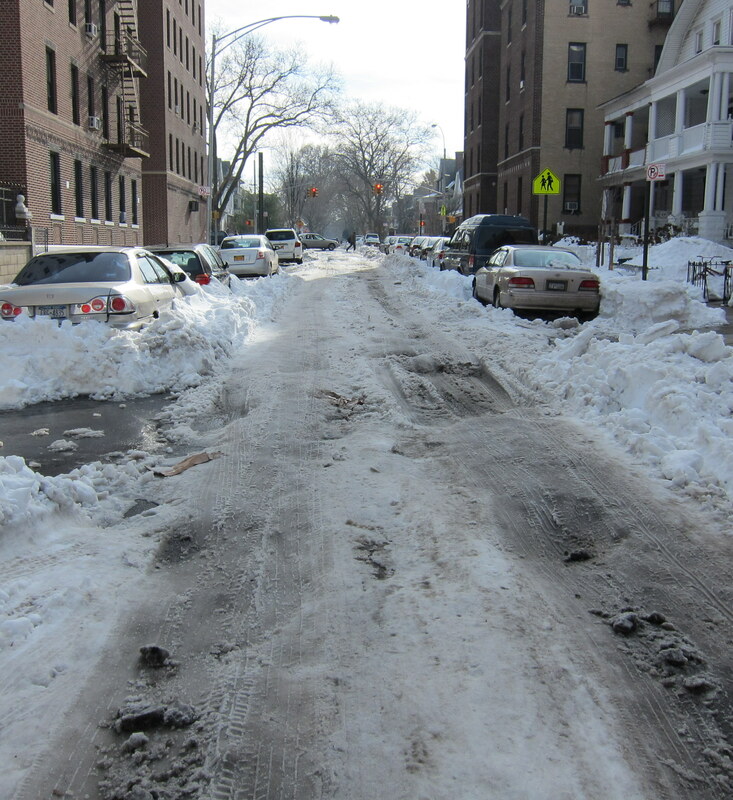 Some eastern Queens streets did not see a plow until Wednesday afternoon and we have not seen salters since last February. It should come as no surprise that some media–with the Post leading the way– are blaming a “vast sanitation union conspiracy” for a failure that belongs on the second floor of City Hall where the mayor and his operations genius hang out. I think this article has it right, but I’d take it a step further – the Mayor is ultimately responsible. Because Goldsmith was out of town, the Mayor had business to either bring him back, or make some decisions for him. John Doherty has done an outstanding job as DOS Commissioner – Let’s see if the Mayor tries to hang him out to dry. Attention Tea Partiers: You want smaller government, here’s what you get! I’ve lived in NYC for close to 30 years and have always been so proud of the city’s response to epic storms, 9/11, the Hudson River plane landing. Last week my sweet little 86 year old mother called from southern Virginia to ask me, “What’s wrong with NY?” None of us could believe the city stranded so many for so long. Should we expect more of the same when the next storm hits? Baloney to the supervisor excuse ! The storm that occurred today was handled properly, without those 200 supervisors. Why? The knowledge of how to handle snow has to have been gained by everyone in the department. Do you mean to tell me that no one knew that they had to plow streets when the snow was falling last week? Did no one in the department know that streets had to be salted when it snows? This was an organized , illegal work slowdown to hold the citizens of NY hostage to the Sanitation Department. HOW DARE THEY ! They are responsible for people’s deaths. They should be prosecuted. President Reagan fired all of the Air Traffic controllers for similar actions. Bloomberg owes it to all of us to do the same. We cannot be extorted and terrorized by our own workers. Excellent points, Joe. Since when do we blindly support unions who abandon us? Why should we be held hostage? Who’s really in charge? The TWU walked out on us a few years ago – they should have been replaced. The San men gave up on us more recently – they should be replaced. There’s nothing wrong with having an honest conversation about whether it’s in our interests to privatize government services or not. To not have such a conversation would be a disservice to all citizens (and taxpayers!) everywhere. Don’t protect the status quo. It hasn’t done us any good. Competition and ingenuity is what made this country great. Not the complacency and mediocrity some of our City workers have to offer. If they can’t do a better job it’s time to replace them.